In order to have a commanding presence, personally and professionally, you need to be able to communicate in such a way that people can understand you clearly and succinctly. There are three primary styles of communication. We all use them each of them. But every single one of us favors a specific style. 70% of the people that you will deal with are visually oriented. 20% of the population is auditory preferred communicators. 10% are kinesthetically oriented (sending or feeling based focus). So 2 out of every 3 people you will cross paths with are visually oriented individuals. When you speak to them you need to do it in such a way that they can get an image of what you are talking about. Learn all the tools and techniques you need to master the art of networking. You need to spend more time focusing on creating the vision or the picture. This is true whether you are dealing with somebody one on one, or dealing with a large group. You need to pay attention, and as you present, make sure that you are giving them something to see, so they have a picture in their minds. You need to be moving yourself so that you are animated, that again gives them a picture. For the auditory component of communication, you need to speak in such a way that your voice has more inflection, more richness to the tones. You need to “play your voice instrument” so that it connects with them. And though only 1 in 10 is feeling oriented, you need to engage them by giving them something to do so that they write notes, they touch, they move, they use their physiology. This feeling and physical engagement makes an impression. The deepest impressions are made in the brain with the more senses you have—see, hear, and feel. If you can see something, hear something and feel something it makes a deeper impression than if you just see it. or just hear it. or just feel it. The more senses you have involved, the more powerful your communication is. I want to talk about the nine different dimensions of nonverbal communication. Because in your interactions with others, whether one on one, over the phone or in front of a group, these are important. One of the things you need to attend to, especially in interactions with people face to face, is how close or how far away from them are you. If you are dealing with someone one on one and you want to be persuasive and you want to have influence you need to notice what an appropriate distance is for them. Most social distance in the western hemisphere is just out of arms reach. That’s the distance most are comfortable with. Have you ever had someone walk up to you and stop right in your face? What do you feel like doing? You automatically feel like backing up. So make sure that you are not invading someone else’s space when you are talking with them. Make certain that the proximity is appropriate. The Psychology Of Making An Exceptional Person-to-Person Connection. Would understanding the communications that promote goodwill and the communications which turn-off others be of benefit to you? Have you ever lost a customer and wondered how to bring them back? Would knowing the drivers that motivate people to take immediate action help you? Starting today you can apply strategies that boost the connection between you and others’. 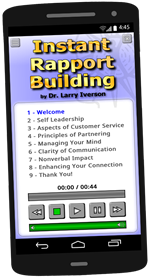 Psychologist, trainer and author Dr. Larry Iverson will give you proven tactics for improving your communication, diminishing misunderstandings, and building a strong person-to-person connection.